Gratitude is a biblical virtue. God calls us to be thankful to those who help us. And the people who donate to our church certainly deserve our appreciation. This can come in the form of verbal praise, high fives or baked goods. But the most basic way to recognize givers is by writing a church donation letter. How do you write a church donation letter? How can you write a letter asking for more church gifts? What tax information should you include in a donation letter? These are all great questions that you might be asking yourself. Luckily, writing church donation letters aren’t as tricky as you might think. It all comes back to gratitude—finding ways to write letters that express your church’s thanks for the support of others. The rest is just technical details we can help you with. So if you’re looking for a few sample donation letters you can copy and paste before sending to your church donors, look no further. We’ve got you covered. Why Write Church Donation Letters? In a previous blog post, I shared the different ways your church can thank donors—from automated emails to year-end giving reports. Printed donation letters also play an essential role in your church’s stewardship efforts. Donation letters are the Swiss Army knife of your church’s gratitude arsenal. It may not be the most powerful—but it’s versatile, handy, and gets used often. A single, well-crafted donation letter can pull together several of these things simultaneously. Better donation letters lead to more giving, which leads to more donation letters—thus creating a cycle of on-going church generosity. Here’s the good news—you don’t have to write an individualized letter for every person who gives to your church. That would be tough to do for even smaller churches. And most donors don’t expect you to. They’d rather you be putting their gift to better use in the community, instead of ceaselessly writing thank you notes. With the possible exception of some unique circumstances, your church can use template language for the majority of your church donation letters. You’ll have to add in custom details like the donor’s name and gift amount, but you can write everything else in advance. To make this even easier on you, here are a few basic church donation letter templates you can copy and paste. Keep in mind that not all of these have to be in print—you could just as easily turn some of these samples into email appeals. The Donation Acknowledgement Letter is a basic way you can confirm and affirm a monetary gift to your church. Sending these is standard practice in church and nonprofit culture. I want to personally thank you for your donation of [gift amount] to [church name]. We’re honored you would bless us with your generosity. Donations like yours make a big difference in the work our church is doing in the community. Without givers like you, our church can’t have an impact or influence in our community. With your support, we’re partnering with local nonprofits, sending out global mission trips, and hosting small groups on topics that help real people like you. Together, we can make a difference. Because we’re a tax-exempt nonprofit, you also get to write this donation off on your taxes. This letter serves as official proof of your donation, so keep it in your records come tax season. At the end of the year, we’ll also send you an annual recap with how much you’ve given to the church. Thank you for supporting [church name]! Not every church member realizes the importance of giving, or understand Bible verses about tithing and giving. So a Donation Request Letter helps to spread that awareness and encourage a spirit of generosity. How are the finances in your household? That was a rhetorical question, so you don’t have to answer—besides, this is a letter so we wouldn’t hear you anyway. But we still want you to think about that question. Money is a uniquely human issue, one we all struggle with to one degree or another. Even if you’re financially blessed, you still have the burden of stewarding your money wisely. And we believe that one of the best ways to invest your money is into the local church. Tithing (giving 10% of your income) on a regular basis not only supports the work we do at [church name]. It doesn’t just support local missions and community growth. It also shows an obedience to God by making his work a financial priority in your life. So if you find yourself ready to put God first in both your heart and your wallet, we encourage you to make a one-time gift or sign up to make recurring donations. That way, you won’t have to ever wonder again about the financial status of your household. Many church donations aren’t just one-time gifts. Plenty of givers contribute monthly—and that should be acknowledged. Use this template to correspond with recurring givers. Thank you for being an active and faithful member of our church community. By giving to our church on a monthly basis, you’re showing that our church has a meaningful place in your heart. We just wanted to write this to let you know that you’re in our heart, too. Donating to the church monthly allows us to preach the gospel, make disciples, and support others in our community who need help. Others like the local food bank and the nearby homeless shelter. We’re answering the cry of the needy, and it’s all thanks to contributors like you. At the end of each year, it’s customary to give your church supporters a summary of their gifts. The primary reason is for tax purposes, but it’s also a way to recap everything your church has done over the past year with their support. You’re getting this letter because you gave to [church name] at some point during the past year. That might have been a one-time gift, or recurring donations. Either way, we want to thank you for your generous support. Every contribution helps. One of the official reasons for this letter is for tax purposes. That’s right—you get to write these donations off on your taxes. Which is why we’ve included a summary of all the contributions you’ve made to our church this year. But the other reason for this letter is to let you know what we’ve done with the money you gave. We take stewardship very seriously, which means we value spending our time and resources wisely. During the year, our church supported local nonprofits, sent global missions teams, and baptised quite a few people. It was a great year for us—thanks in large part to donors like you. So thank you for your support of our church, and we hope you’ll consider continuing to contribute to our mission in the coming year. Sometimes you need to make a more significant financial push using tried and true church fundraising ideas. Some churches call this a Stewardship Campaign or a Church Capital Campaign. Either way, the goal is to raise a certain amount of money for a big project. And typically, a solid letter of appeal is an integral part of that. God has a plan for everyone and everything. That includes you, and it includes [church name]. None of us can fully know God’s plan—the best we can do is pray and listen for clarity. Our church leadership has been doing just that and are excited to announce our latest church project. But we can’t pull this off without your support. Whether you give to the church on a regular basis, or just attend on occasion, we’re asking you to consider contributing to this massive undertaking prayerfully. It’s something we need our entire church community’s help with. Even if you can’t make a large gift, know that every little bit helps. It’s more about coming together as a community united behind a common cause. We hope that you’ll consider making a donation towards this great step forward that we’re making together. Examples: Add specific examples of how your church will use the donation. Tell a story about the work your church is doing in the community and connect that with giving. Personalization: For regular donors, don’t be afraid to add a short, handwritten personal note. This shows that you’ve singled them out with praise. Timeliness: Sending donation letters quickly reminds people you’re thankful for them. But this also takes organization and efficiency. All the more reason to use pre-written templates. Storytelling: Everything is better with stories—including donation letters. Weave in a specific narrative of how your church is making a difference and how the money will be used. There’s no one right or wrong way to write a donation letter or request contributions. You’ve got to do what is right for your church and congregation. But if you stick to these general tips, you’ll probably start to see some traction when it comes to giving. Most people don’t love talking about money in church. But it’s a necessary and vital part of your church. And maximizing your efforts when it comes to donation letters will help make those conversations more comfortable. So what do you do next to put this into effect? Customize these letters: Take the samples above and make them work for your church. Personalize the content. Remove the stuff that doesn’t sound genuine and add in stuff that does. Remember that these are just a starting point. Create some systems: Develop processes that make it easy for you to replicate sending donation letters. Use a letter template that allows you to drop in names and details. Then develop guidelines for when these letters will be sent out. Empower a champion: Find out who is going to be responsible for making these letters happen. Rather than thinking of this as adding more work to their plate, think about how you can elevate their work. This could be a staff member, or a volunteer. Start sending: All of this will be for nothing if you don’t actually send out the letters. Take the time to get it right and get them into the hands of your church donors. And if you’re looking for ways to grow your church’s giving capacity, Tithely can help. We provide several different ways your church members can support your church financially—from online giving, text to give solutions, and giving kiosks. Tithely’s systems make it as easy as possible for people to give to your church. Now all you need to start doing is generating a culture of gratitude. There’s nothing standing in your way. 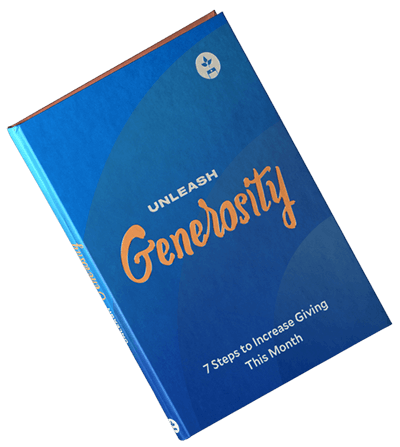 Go unleash generosity in your church. How does your church use donation letters to spread generosity? Share your thoughts in the comments below!